Yay! My earrings were featured in SheKnows.com, "Funky stud earrings for every day." # 9 -NiceLena "Color Block Mod"
"Stud earrings don't have to be a boring accessory for the days you can barely pull yourself together in time for work. Here are 10 stud earrings that are both unique and practical for everyday wear. All too often, stud earrings are the fashion terrain of pearls and diamonds. But what's a trendy girl going to do with boring old gemstones? 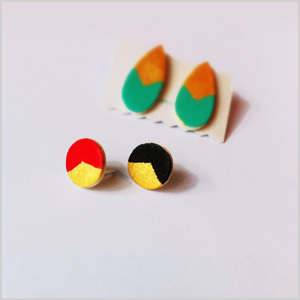 Check out these cute and funky earrings that you can feel proud to wear every day."